Here’s the current status of the Laurel Little Tavern, Now the Laurel Tavern, post remodel. To see some older photos of this one, look at the Diner Hotline, a wonderful blog, and a wonderful resource. The original is gone. The beautiful original neon signage, the last remaining is gone. The backbar with the green mirrored panels, built as per Harry F. Duncan’s original 1933 Patent, D89950, is gone. The stools, the tile, everything that made it the original is gone. The rest, closed, their buildings converted or torn down. 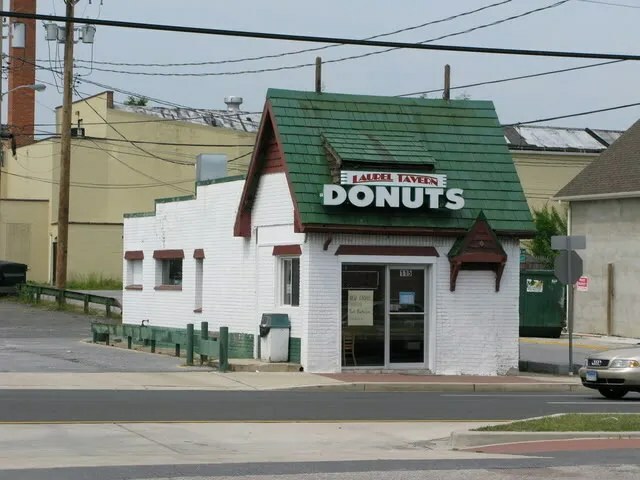 We lost the Silver Spring Little Tavern, the one with the yellow roof, just a few months ago. 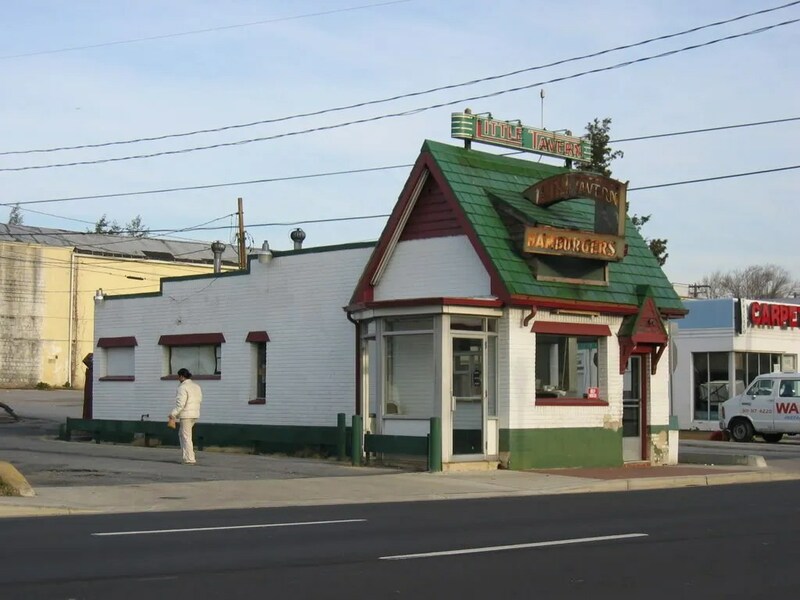 I am saddened by the passing of the original, the real Little Tavern. May she rest in peace. This entry was posted in Diners / roadside related, Diners/ restaurants, Roadside attraction and tagged Baltimore, Chevy Chase, DC, diner, Donut, Fast food, George E. Stone, Harry F. Duncan, Jecco Co. Inc., Kentucky, Laurel, Little Tavern, Little Tavern Hamburgers, Little Tavern Shops, MD, neon, preservation, Remodel, roadside, rt. 1, Silver Spring, sliders, Stonebrook Corporation, Tudor Cottage, Washington, White Castle, White Tower by Spencer Stewart. Bookmark the permalink. Great to see you have a blog now. I just made mention in Diner Hotline and put a link in my post as well as in my blog roll for this. I’m more troubled about what happened INSIDE. I am a sign collector in Maryland. I was able to rescue all of the neon displays from the Laurel LT. (They were up there by habit, believe me)! Norm, that’s wonderful news! I was quite worried about the fate of the signage, good to know its in safe hands. I am extremely interested in acquiring at least two of the Little Tavern coffee mugs for my husband. He lived in Maryland for years and used to frequent “The Little Tavern” in Laurel, Md. I would love to surprise him with authentic mugs. Mary- they come up on eBay fairly regularly, but demand a good deal of money most of the time. After I restored the neon signs from the Laurel LT, I decided they were awkward to display. I built a full-scale LT on my property (just not as deep a building). It took about a year, mostly the fabrication of all the metal roof tiles and exterior wall panels. I carefully patterned the dimentions from the abandoned LT on Belvedere Ave., in Baltimore. It is on YouTube, search “Little Tavern”. 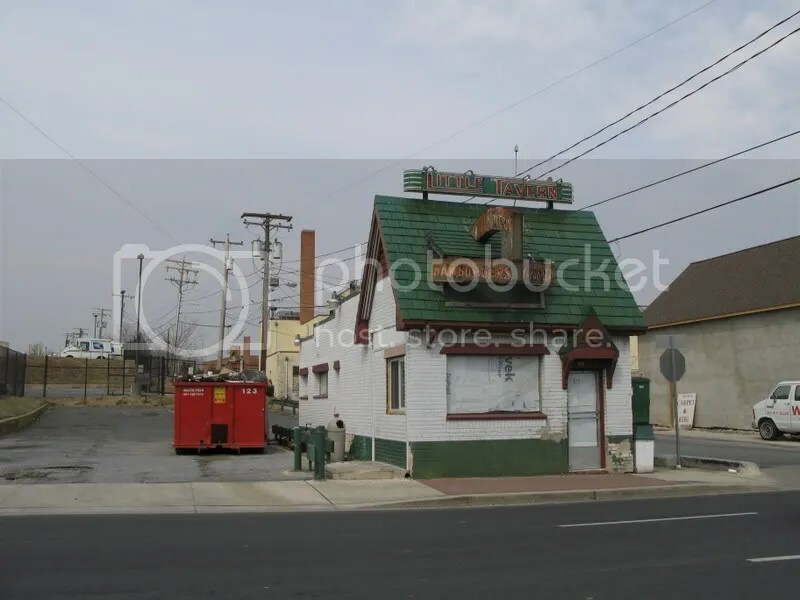 There is a Little Tavern building still operating as a restaurant at 3125 Wilson Blvd, in Arlington, VA. It’s a pizza place now (or it may have become a Middle Eastern place since the Google street pic was taken.